di mainstone’s “human harp” | Abler. 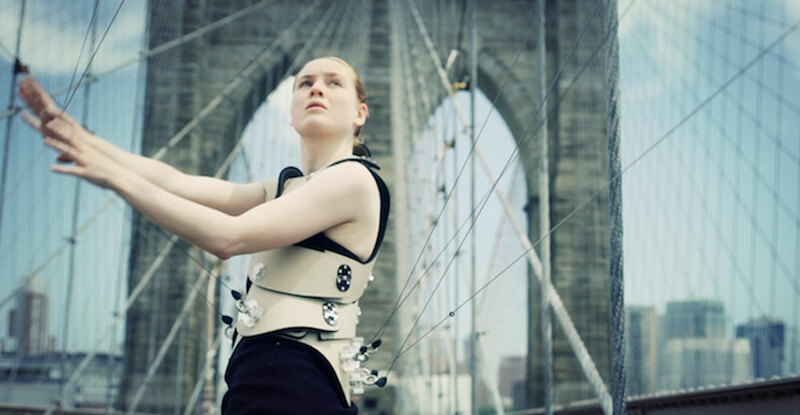 Di Mainstone made a human harp: prosthetic for playing the strands of a suspension bridge, structurally so like the strings on the instrument. 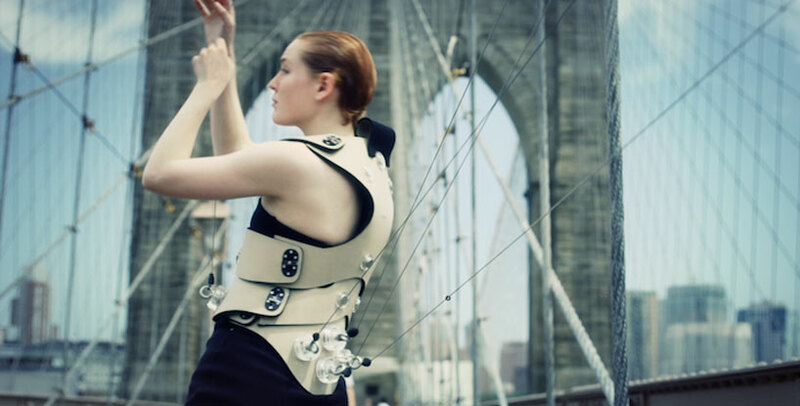 The wearer dons the piece and attaches retractable strings to parts of the bridge, recording its sounds and playing them back in a dance between the structure and the body. 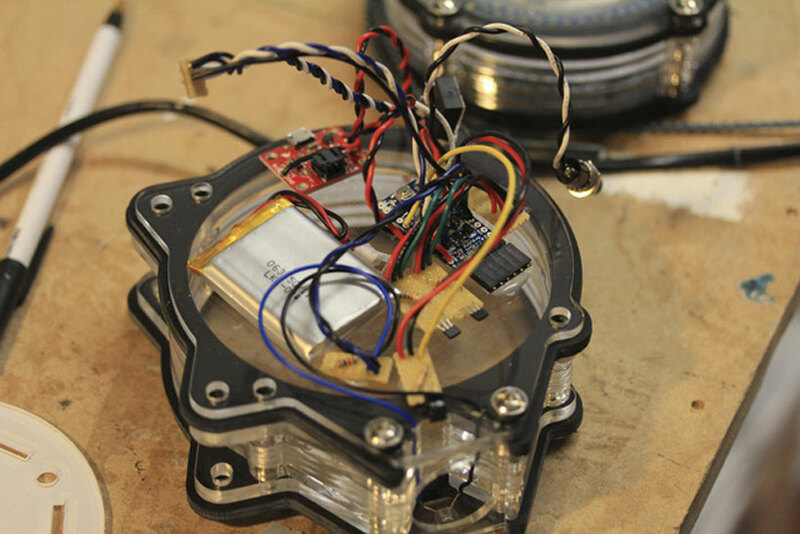 This is an extraordinarily beautiful and physically complicated assemblage—the video below shows how responsive the sound outputs are designed to be to each bodily move. It looks like this is a prototype-in-development, with aspirations to play multiple bridges with a collaboratively refined interface. The concept was Mainstone’s, born from a walk across the Brooklyn Bridge; but it’s refreshing to see how large her team of advisors and collaborators is—you can see the large list at the end of the video. She’s the creative director, openly seeking research to further improve the work. And it’s lovely that the piece was performed in May of this year, a celebration of the iconic Brooklyn Bridge’s 130th anniversary. Humanharp from humanharp on Vimeo. I am a Scottish architecture student writing about, designing for and inspired by physical diversity. I am particularly interested in access to the built environment and the unique relationship each body has with it. My ambition is to get a new generation of architects excited by, discussing, and even arguing about accessibility. I believe that only then can we begin to improve access to our buildings. I completed the first part of my training at Edinburgh University and upon graduating, I received the T. Bowhill Gibson Travelling Scholarship. This enabled me to continue my research in the US. I am currently engaged in developing new design models for accessibility while studying for my Diploma at Glasgow School of Art. When I’m not writing, drawing or making models, I tweet at @AnnaRaymond_.